With the Battle for Azeroth pre-patch, we’re introducing World of Warcraft Communities, a new feature that will let you create, manage, and join multiple groups of friends and family. Whether you have a dedicated group that just likes to role-play, a group that is all about pet battling, or another that is focused on Mythic dungeons, Communities will allow you to bring them all together—no matter what realms they’re on. Not only will you be able to participate in a variety of Community groups, but you’ll be able to maintain your membership in your guild at the same time. 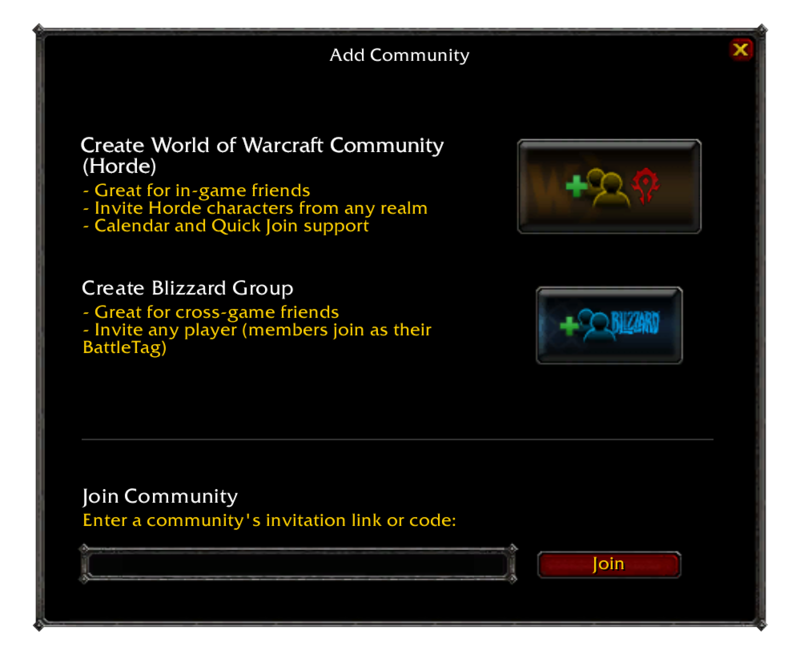 You can create and manage a World of Warcraft Community through the Guilds & Communities tab (J), where you’ll also have access to Blizzard Groups. Blizzard Groups allow you to connect with cross-game friends and other players even beyond World of Warcraft via the Blizzard Battle.net desktop app; Communities are specific to the character you’re creating the community with and are great for bringing together in-game friends. Communities you create are open to same-faction characters from any realm within your region. You’ll be able to invite characters directly, provide a code, or send an invitation link to those you would like to invite to your newly-created community. You’ll also be able to create calendar events specific to your community and use Quick Join to hop into groups together. As a part of this new feature, players will also be able to take part in Community-specific chat (text and voice), create and manage channels, and easily switch between them right within the Community interface. 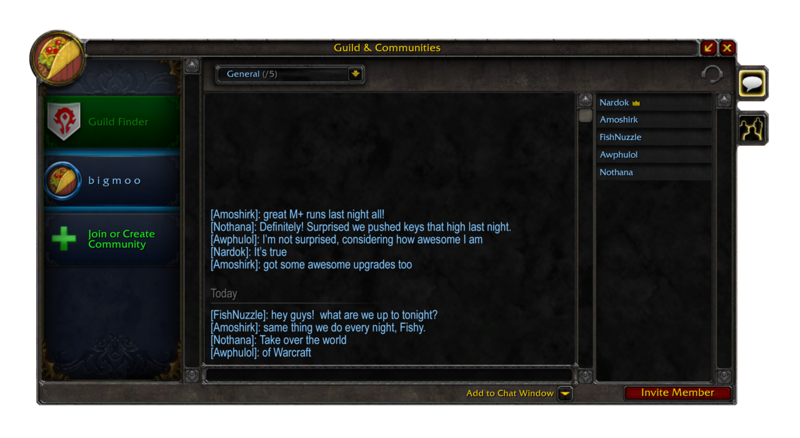 The new feature also provides a chat history, which we’re also bringing to guild chat. World of Warcraft Communities will be available soon, with the Battle for Azeroth pre-patch—stay tuned for more information. You can learn more about how to create and manage your Communities in our support article. For additional troubleshooting help with joining a World of Warcraft Community or Guild chat, visit our support site.